Hands up who's has a spray tan disaster? I've only ever had one done once and it was a complete and utter mess. Despite prepping my skin for days, exfoliating, moisturising and following all the instructions I was given, I got the full Oompa Loompa effect....and as for my feet - well they were still orange 3 weeks later! I vowed never to let a tan spray near me ever again. Then, 3 years on from that tan trauma, I read an article by my friend and fellow local blogger Nic. she was writing about her first ever Vita Liberata spray tan. I immediately emailed her to ask lots more questions and she allayed all my fears. 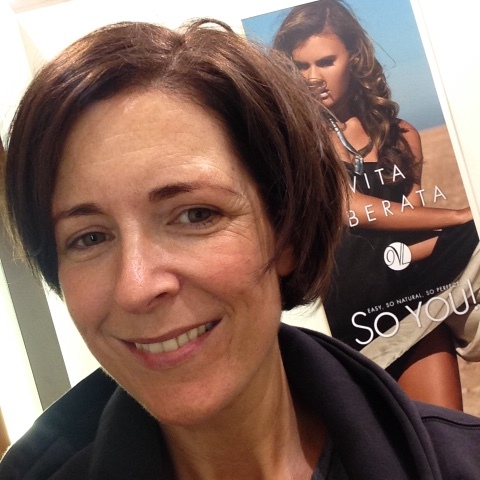 I was especially drawn to Nic's description of the lovely Angie, who is the manager of the Belfast Vita Liberata tanning booth in House of Fraser. Down to earth, friendly and expert at putting people at ease - so important when you're stripping off in front of a stranger! 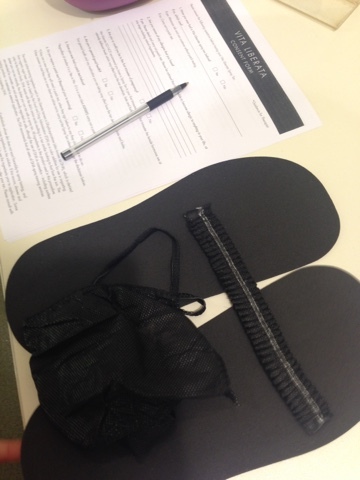 Decision made, next time I had an event worthy of it, I would take up the long standing offer from the team at Vita Liberata to try out the booth myself. And a few months on, the choir Christmas concert in the Waterfront Hall was that worthy event. So the day before the concert, I headed into Belfast wearing my flip-flops and comfortable leisure wear (hoping I'd not meet anyone I know!!) with two 7 year olds in tow. Luckily, Angie was as lovely as Nic said. She took me arriving with the kids completely in her stride and cheerily showed us into the tanning booth, which is located in the Beauty hall on the Ground floor. First up, Angie explained about the types of tan and colours available and reassured me on the Oompa Loompa worries. She gave me some pads to stick onto the sole of my feet, a hair cap and a pair of disposable pants. The pants are optional - you can chose to leave your own underwear on or indeed, wear nothing at all. Angie assured me she's seen it all, lumps & bumps, men & women, 18 year olds and 80 year olds - so nothing will shock her. You also don't have to worry about putting anything on your skin before hand. Ideally, you need to come to Angie with nothing on your skin, no perfume, no deodorant, no moisture. She will prep all the areas that need it beforehand....so that there's no clumping of colour around the drier areas of your body. Given my event was on stage, I was recommended a good coverage of the medium colour - Equador. I opted for the classic formulation, which means I would have an instant tint visible after the spray. It would develop further over the day to a darker colour but once I showered, I was assured it would look more like the original colour. All of the tan colours can be applied as an invisible formulation too, which doesn't colour the skin immediately - it develops slowly over the hours afterwards. Oh and there's an anti-ageing formulation available too. It really amazed me how much technology is involved in the Vita Liberata tanning process and it's more remarkable because this technology has been achieved without the use of chemicals. 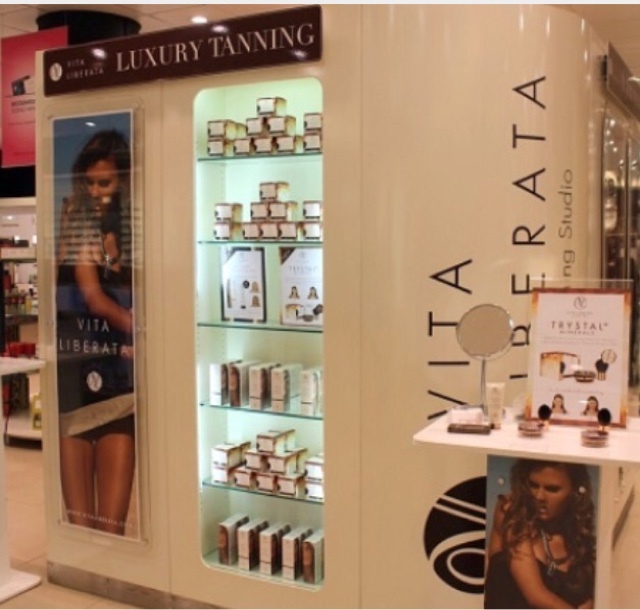 In fact, Vita Liberata's ingredients are the purest in the tanning world. They only use natural, certified organic and Ecocert ingredients. I wrote more about this in my post where I reviewed their facial tanner and unique bronzing tanning crystals - both of which I use constantly and have re-purchased. The verdict? Well, this is me immediately after (makeup-less). There's an obvious colour but it's subtle and I definitely wasn't as self-conscious going back to the car. The power of a tan! I had my spray done at 10am and for the rest of the day, I wore loose clothing but was pretty much able to go about my usual business. I needed to keep my hands out of water but I found that easy enough to stick to :) Many of Angie's clients get their tan done in the evening and go straight to bed. Either way, you need to wait at least 8 hours before showering. By bedtime, I was really very brown and confess to being slightly concerned about looking too tanned for the concert. But I needn't have worried. I had a cool shower before getting into bed and the result was amazing - really natural, no streaks and most importantly, no dark patches on the ankles or elbows. You can see all the photos of the event on this link. It was just amazing to have the all-over colour and I was probably most disappointed that I didn't go for a backless dress as the colour was so great on my back! Definitely going to do that next time. In terms of wear-off, I looked after my skin well for the next week, having cooler showers, patting dry and moisturising. By the following Saturday, it had faded off naturally with just a little bit lingering in drier areas...this was easily buffed off with my exfoliating glove. The Verdict? I was really impressed with this treatment and will have it done again for an occasion or if I'm going on holiday. It's not something I could afford to have done more regularly but I would definitely get one or two done over the summer if we get some decent leg-baring weather this year. Disclaimer: the spray tan was provided to me free of charge but I was not required to blog about it and all the words are my own. Thanks for supporting the brands that support this blog. I had a vita liberata spray tan and it was a big mistake!It smells horrendous until the first shower the colour was uneven and started to come off after 3 days.. it looked horrendous. Not a fan at all.